If Sun Tzu wrote “The Art of Production” he’d probably say that every production battle is won before it’s fought. An effective battle plan is the shooting schedule, and it’s the difference between making our days and staying under budget. Even with the abundance of film scheduling software available, there’s no replacing working with department heads to ensure that their needs are met and situated within a reasonable time frame. Working from the script breakdown below, I highlighted some of the most common shooting schedule mistakes. 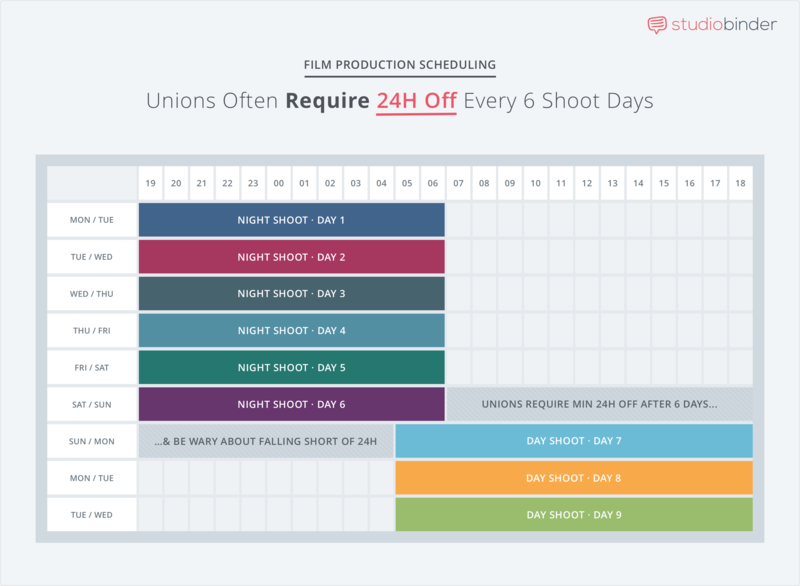 Download our free shooting schedule template right here. A common beginner’s mistake when creating shooting schedules is comprehending turnaround time when moving from Day to Night Shoots. This is something that film scheduling and production software don’t necessarily provide. When attempting to flip to a day schedule Thursday, you’re trying to work a 24-hour straight period, which no UPM in their right mind would do. Beyond 14-16 hours you’re now paying double time to SAG and Crew Unions, and beyond 16 hours, each additional four hours is a 1/2 day’s wages, and beyond 20 hours is a full day’s wage. When you attempt to break up the work week (e.g. working three days on, one day off) this extends your rental fees, SAG costs (if on location), production insurance, and various other factors, so be aware! You should always organize the Night and Day Portions into their respective “blocks” and beware of this when organizing your film production software. For lower budget production, a big issue is flipping from Day to Night after a six day week. Let’s look at the following stripboard as an example. Monday: 05:00 – 19:00 Tuesday: 05:00 – 19:00 etc.. Bleeding into Sunday makes things trickier because there is not really an “OFF DAY” as you spent ⅓ of that day working. This gets into a gray zone of what the Crew and Performers will accept. While receiving 22 hours off, you have to think that they will spend approximately 16 of those hours sleeping, leaving them only six hours of “weekend” to cover normal life stuff. 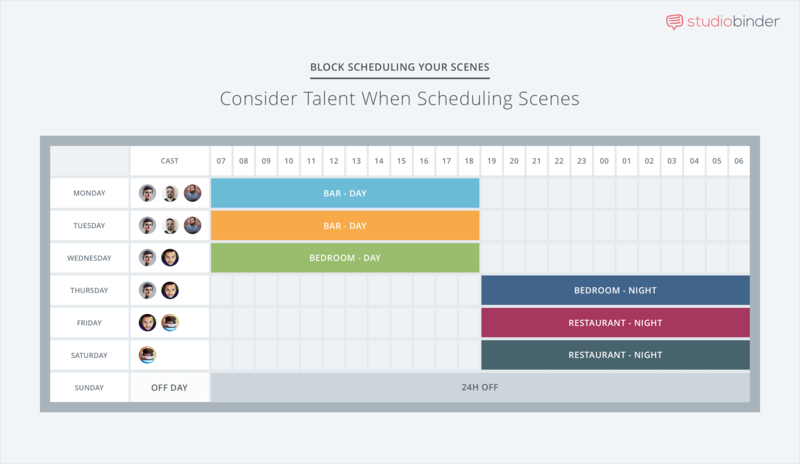 This type of shooting schedule isn’t a deal killer, but it can destroy morale, if exploited. For more information on stripboards, find out how to make a better shooting schedule by using a stripboard. The DP might opt to “blackout” the locations, allowing you to avoid having to shoot at night, but you get the point. It’s logistically friendlier to shoot out of order and saves money. Another important block shooting strategy is to discuss shooting individual scenes with the DP and Director. In the case of the bar scene, you would set up and light the Counter sequence first, shoot both scenes, move onto the Table next, shoot both scenes, etc. This is challenging for your actors, but so long as the director and performers are comfortable with it, the strategy could save you hours per day. Nothing is worse than having to “flip the world” (turning 180 degrees to shoot in the reverse direction), only to re-flip because you’re now at a later part of the story, forcing a relight and reorganize what you already had lit and set up in the first place! Another huge and potentially expensive problem (if on location) is failing to properly schedule your performers. If you want to shoot in sequential order, it demands you keep performers A, B, C in queue for five days when they’re only required for three. It gets more expensive is if you’re on location where you must pay for their hotel, per diem, a rental car to get around, and possibly additional payment for their off days. All because you want to shoot in order. Basically, I’m just replicating the previous block shooting schedule to easily demonstrate this point, but just imagine how confusing things get when you’re attempting to manage expensive performer schedules with block shooting and Day/Night splits! Novice producers or directors usually fail to comprehend how long it takes to complete a company move (i.e., striking the set and moving to a new location within the same production day). The simplest way to break it down is looking at the grip equipment. That is 2,000-10,000 pounds worth of equipment that needs to be packed up, shipped out, then unpacked, organized, and set up, and then packed up once again, organized, and ready to ship out for the next day. And that’s just Grip and Electric. Combine this with every other department and you can understand how it often takes 2 hours from strike to new setup at the next location. Try finding two locations on the same side of town, allowing you to take only what you need and leaving the remaining equipment with a PA.
Film production and scheduling software cannot evaluate how much “stuff” there is to move; only how many people, so make sure you talk to your Department Heads about this. You’d be surprised how easy it is to make what you have work. I’ve been on countless shoots where we simply flipped the camera, and the location looked completely different. It’s not ideal but it’s always a possibility. Finally, it’s important to emphasize the importance of turnaround times. Anyone in SAG and the various Crew Unions are required to have a 12-Hour Turnaround. Anyone who tells you 8-10 hour turnarounds aren’t awful is lying, as you’re left with nothing more than the ability to go straight to sleep, wake up, and head right back to set. In my experience, short turnaround times often lead to poor work performance the next day. The film production schedule might have gained an hour by starting at a particular location earlier, they often pay for it on the tail end, and with the overall effort. If you’re stuck between a rock and a hard place, then it’s best to have a meeting with the crew and ask how they feel. Small gestures like a nice breakfast go a long way in keeping morale up during those late night hours, when everyone is just trying to make it through the day. At the end of the day, no amount of film production software is going to generate the most efficient schedule. Film production software isn’t aware of time constraints, human exhaustion, or the unknown Murphy’s Law variables that plague every shoot. It will organize the data in the most efficient way possible, but at the end of the day it is between you, the Producer, Director, and various Department Heads to discuss and strategize the best shooting schedule that works for everyone. 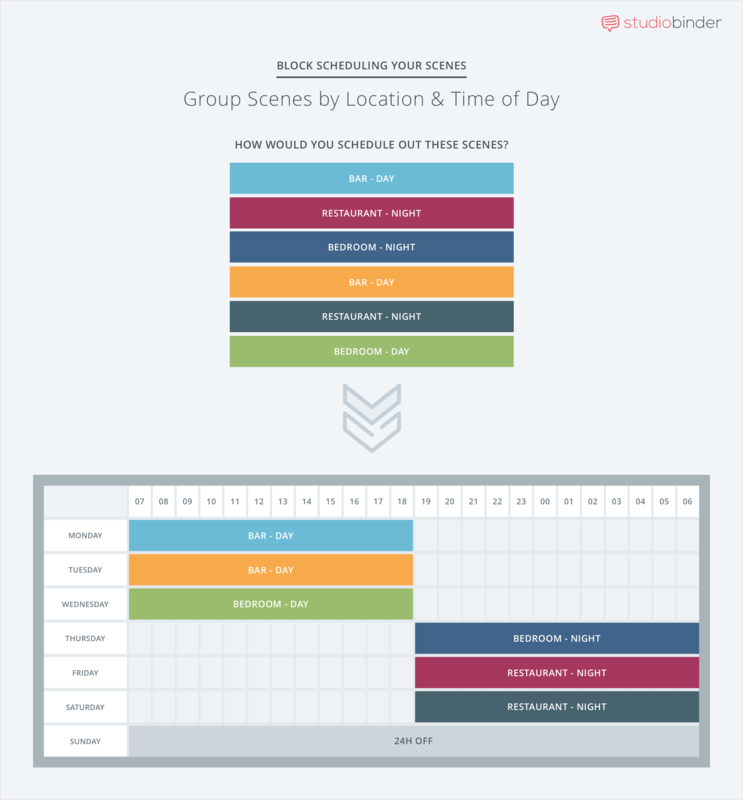 Be sure to download our free shooting schedule template. For professionals, I advise checking out Movie Magic shooting scheduling software. 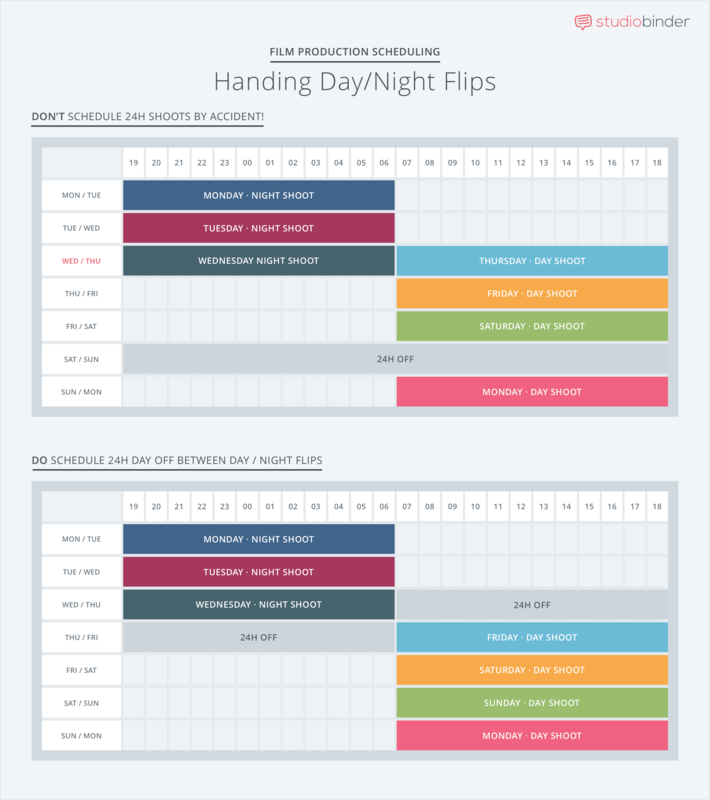 Easily plan and create shooting schedules. Import scripts and reorder scenes to make a schedule. Add day breaks to mark shoot days. Spin-off call sheets when you're done. ​Jon Cvack was born and raised in the southwest suburbs of Chicago, studying Philosophy and Film & Media at Loyola University Chicago. His first feature film "Road to the Well" which he wrote and directed, is currently touring the festival circuit, having had its World Premiere at Dances with Films in Hollywood, going on to screen at San Diego International, Lone Star, Twin Cities, and Long Beach Indie Film Festival, where it won "Best of Fest" and Orlando Film Festival where it won "Best Supporting Actor". He's the editor of YellowBarrel.org, where he offers is thoughts on films, both old and new. Shot Listing Like a Pro: When Do You Create a Shot List?